Made from expanded starch, Pop Starch is 100% compostable and biodegradable with no disposal costs, easier handling due to being non static - reducing labour time, and having many environmental benefits. Pop Starch is a compostable and biodegradable expanded loose or void fill manufactured from Starch, protecting Products your Profile and the Planet. A Material Specification and Safety Data Sheet is available for export and customs. Superior flow characteristics reduce packing time and labour costs. Excellent anti-shock and resilience properties make it suitable as void fill and for the protection of fragile, sharp or pointed Items. Low density gives weight and cost savings for transport. Will not ‘spring’ out of a carton, making it tidier and time saving. Naturally antistatic, no time wasting clean up (polystyrene foam will cling to almost anything). 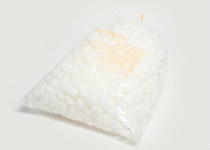 Antistatic properties make Pop Starch suitable for packaging of electronics. Can be compressed to form or take on any shape to prevent product migration. Some countries ban the import of Foam Polystyrene plastic, as they would be importing Landfill. Packaging material showed no signs of volume reduction or under fill in corrugated cartons during a 3 day test period at 40℃ and 80% Relative Humidity. Won't deflate in air shipments. Can be sterilized with gamma rays. Will not attract pests or rodents but is attractive to birds. Not meant for human consumption but will not harm children or pets that may come into contact with the material. 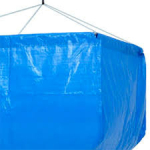 Not suitable for wet environments like chilled products that produce condensation. Manufactured from sustainable renewable materials. Will biodegrade when exposed to any environment containing bacteria and moisture this can be aerobic or anaerobic above or below ground. Biodegradable time is less than cellulose (plant materials). Almost completely dissolves in water in hours, what is left biodegrades. Can be composted with organic waste including food waste to produce fertile humus in a few weeks, depending on temperature, moisture level and micro-organisms in the compost. Can be disposed of on the lawn or garden, or even down the toilet. Reusable, can be recycled through the same waste stream as cardboard and paper. Can be incinerated, combustion is complete with no toxic volatiles or metallic residues. Biodegrades to CO² &/or methane (depending on how much O² is present), water and humus with no polymeric or toxic residue. Manufactured without the use of solvents or ozone depleting substances. Saves waste going to land fill and waste disposal costs. It is important to include the cost of disposal when considering the cost/benefit of other packing products; Pop Starch being free. Pop Starch is not meant to end its life in landfill in fact anywhere else is better for the environment. However if it was sent to landfill then it has completed the anaerobic biodegradability-screening test well within 60 days for test completion. Saves on emissions from and energy for waste transportation. Measurement of the Carbon Foot Print is an indication only as product densities and transport vary but to use a 2010 American Consulting Company study Pop Starch was found to have a Carbon Footprint of only 38% that of Expanded Polystyrene Plastic. 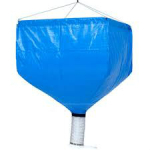 A Pop Starch dispensing hopper capable of holding about 5 bags (1.75 m³) with fittings ready to install is also available. Increasing awareness of issues like sustainability and waste reduction, is effecting change. Economic goals are shifting from growth at any cost, without regard to the environment, health, other people or future generations, to sustainability, with measures like triple bottom line reporting and environment friendly packaging. Pop Starch is a product that is compostable, biodegradable, does reduce waste and waste disposal costs and is sustainable. Specifications: Certified to American Standards ASTM D6400 – Compostable. ASTM D7081 – Biodegradable and Nontoxic in the Marine Environment. VINCOTTE OK Compost Certified. Main component starch. 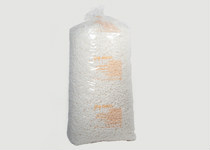 Supplied in 350L bags, allow 0.38 m³ per bag for freight calculations. NOTE:- Please contact us by email (sales@friendlypak.co.nz) or phone (0800 738446) to order this Pop Starch - you cannot order it online at this time. Made from expanded starch, Pop Starch is 100% compostable and biodegradable with no disposal costs, easier handling due to being non static - reducing labour time, and having many environmental benefits. Pop Starch is a compostable and biodegradable expanded loose or void fill manufactured from Starch, protecting Products, your Profile and the Planet. A Material Specification and Safety Data Sheet is available for export and customs. Due to freight complexities please contact us via email or phone to order and confirm delivery costs. The picture is an example only and may not be the actual one.